Unsolicited reviews of art & culture. 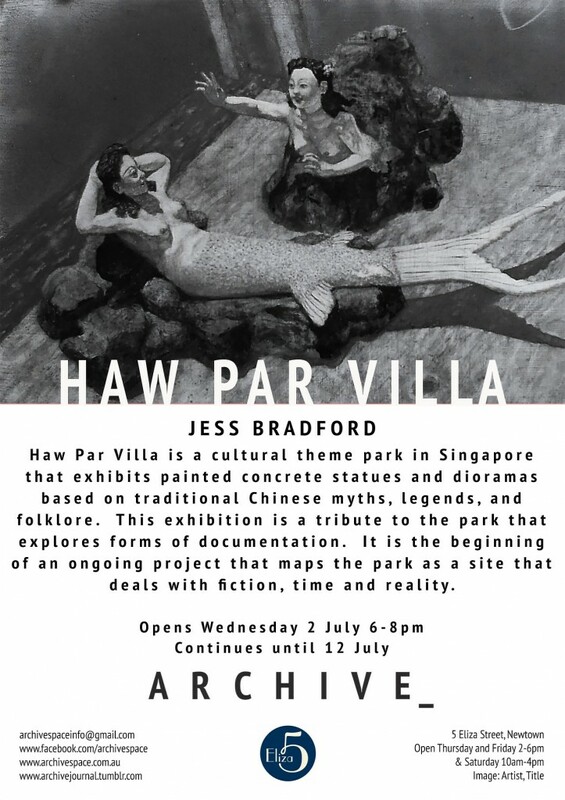 I recently participated in the Archive Space Writers Program, reviewing Jess Bradford‘s exhibition Haw Par Villa which ran 2 – 12 July 2014. Here is the resulting text. This entry was posted in Commissioned Exhibition Essays, Reviews, Reviews & Interviews, Words on 25/08/2014 by Chloé Wolifson. 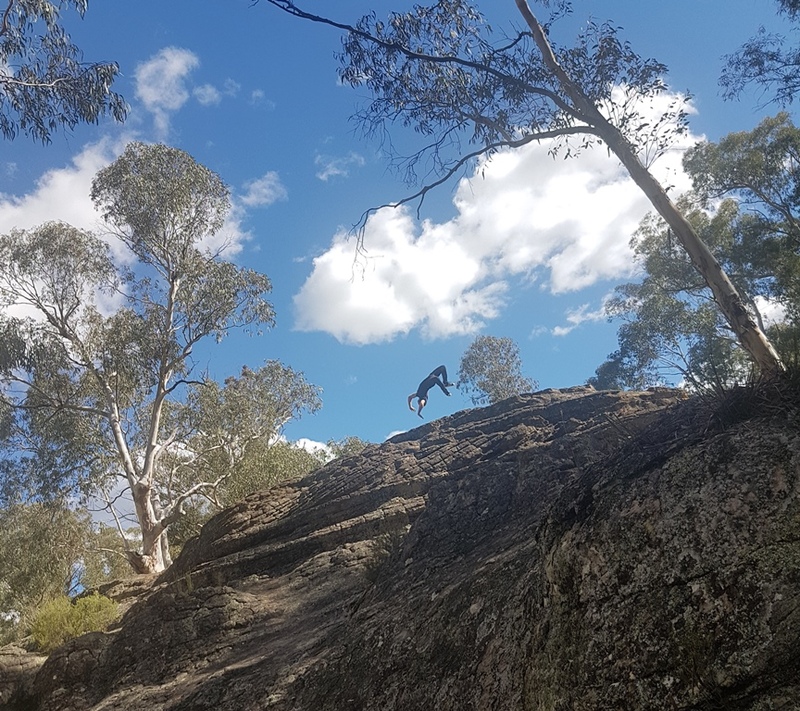 Yesterday I headed down to Trumper Park in Sydney’s Paddington. The area has hosted many creative enterprises over the decades and is currently home to a number of commercial galleries. It’s always an opportunity to see quite a breadth of contemporary work. A longstanding member of the Paddington galleries scene, Australian Galleries were showcasing the canine-centric prints of Deborah Williams and, upstairs, the very fine works on paper of young Sydney artist Angus Fisher. Fisher’s skilled methods and often traditional choice of subject matter bring to mind natural history illustrations from pre-industrial times. When the same techniques are applied to contemporary technologies, such as in the drawing GPS surveying equipment 2014, the works become more intriguing still. Martin Browne Contemporary were preparing for that evening’s opening of a group exhibition, but I managed to sneak a look at some of the works, which included an impressive Bill Hammond painting from 1996. Jensen Gallery were also preparing for an opening, that of Sydney artist Melissa Coote. 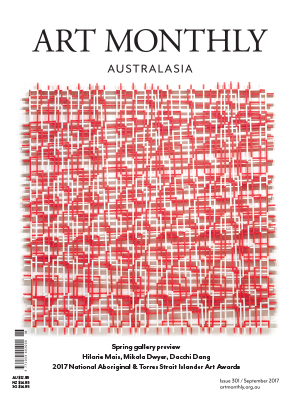 For those playing at home, Coote was the subject of a profile I wrote for the current issue of Art Collector. 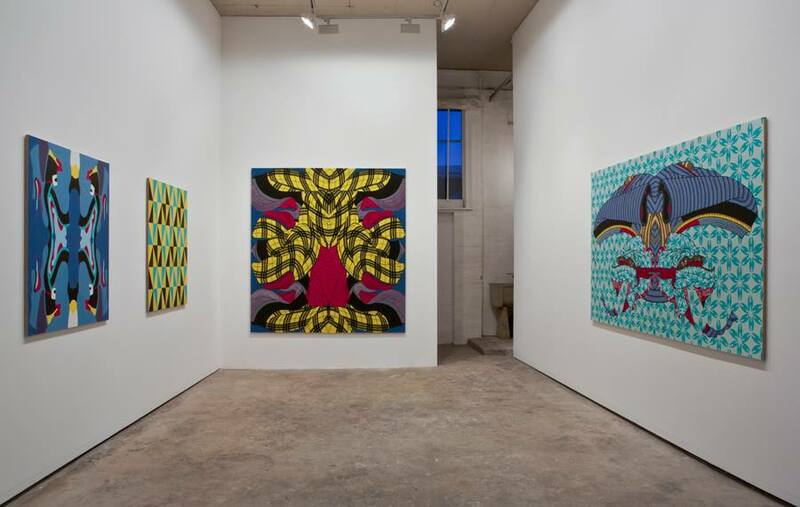 It was strange to see the works occupying the relatively small gallery space at Jensen after experiencing them for the first time in Coote’s expansive Marrickville studio. However, they certainly held their own in the Paddington space, from the large works on canvas to the shining cast bronze goat’s heart that can be held in the palm. At Roslyn Oxley9 Gallery, I experienced déjà vu in the form of TV Moore’s exhibition # E N Y A, which featured two works originally seen in the artist’s recent survey exhibition at Campbelltown Arts Centre (which I covered for Art Monthly). It was enjoyable to have another opportunity to view Moore’s The way things grow (2014), which draws from Swiss duo Fischli & Weiss’s The way things go (1987). 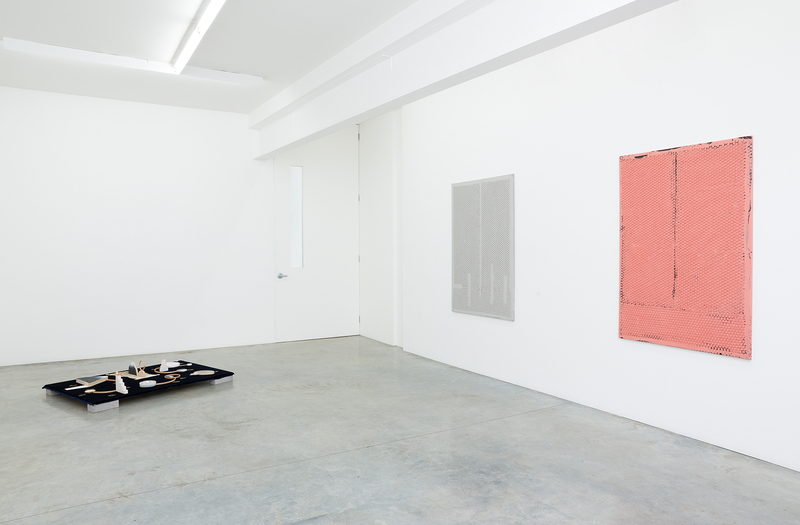 The gallery was also hosting a new group of work by Australian collaborators Claire Healy & Sean Cordeiro. The exhibition, Venereal Architecture, combined the childhood assemblage obsession of Lego with the grown-up assemblage obsession of Ikea. Creatures from the sea and forest, formed from the eponymous plastic bricks, merged their colourful pixelated forms with the minimal aesthetics and artificial plants instantly recognisable as being of the Scandinavian brand. Through its large windows, the front space of Sarah Cottier Gallery looked entirely empty. It was, however, occupied by the microcosmic maximalism of Matt Hinkley. 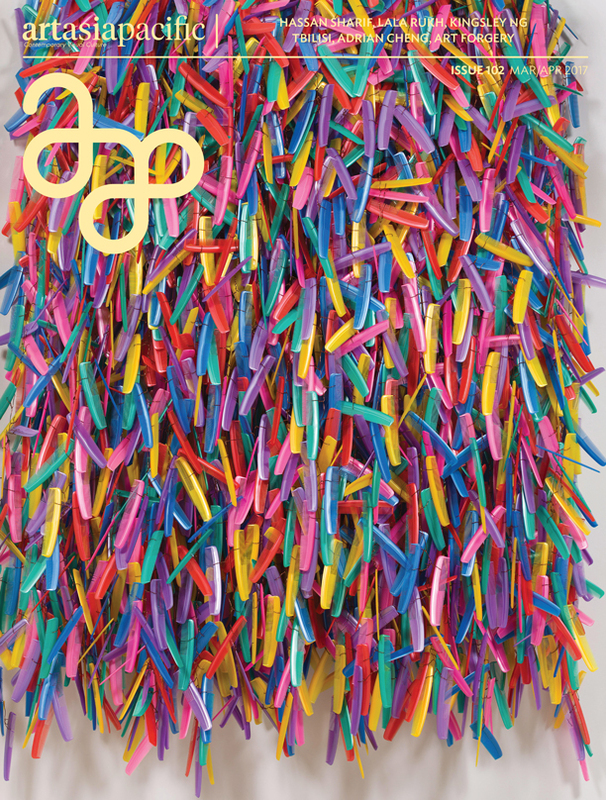 Multicoloured cast plastic clumps were suspended at eye level from wonky pieces of wire hung at intervals through the gallery. These polyurethane caches held melty bits of detritus, the sort of stuff you’d sweep off the surface off your desk if you ever bothered to clean it, or scraps you’d find down the back of the couch. Replicated in great detail, bits of ear buds and headphone jacks, denied their original functions appeared jewel-like as they hovered in and out of the field of vision. Christopher Hanrahan’s exhibition Oe worked nicely with Hinkley’s presentation, with Hanrahan’s large, minimalist pieces inhabiting the adjacent space and saying just enough. 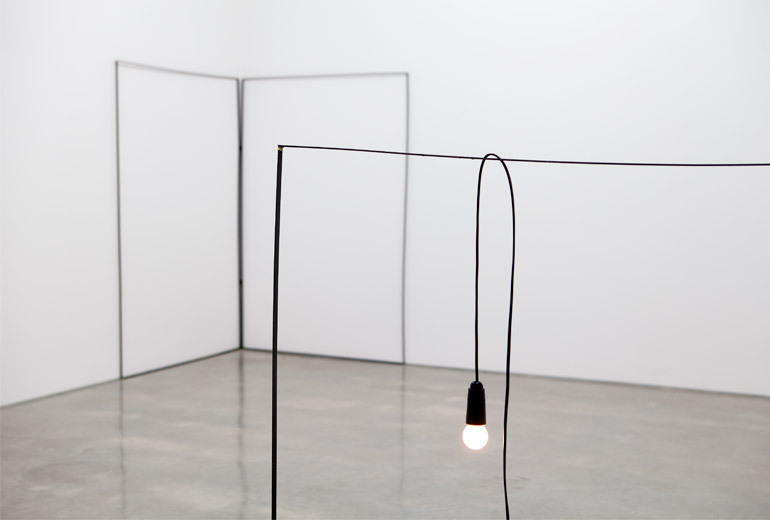 In Oe (bodies) (2014), a worn-looking, thin steel frame sat out from the wall, draped with an electrical cord from which dangled an illuminated bulb. The cord’s vertical snaking gave imaginary surface to the rectangular void, rendering it diorama-like. The similar metal frame of Oe (staging) (2014) nestled into a corner, presenting the wall beyond like a portal, or an open book. I had noticed another recent work by Hanrahan, quietly occupying a corner of Sarah Cottier Gallery’s suite at Melbourne’s Hotel Windsor during last week’s Spring 1883 art fair. Standard Model (not quite how it is, but certainly how we could be—definitely within the realms of possibility) (2013), a trifold brass frame held upright with the help of two pieces of marble, embodied notions of presence and absence, movement and stillness, just as its siblings in the Sydney space did. The fact that such elegantly simple sculptures can hold their own as much in an elaborately decorated hotel suite as equally as in a clean white gallery is testament to their strength. This entry was posted in Reviews, Words on 22/08/2014 by Chloé Wolifson. 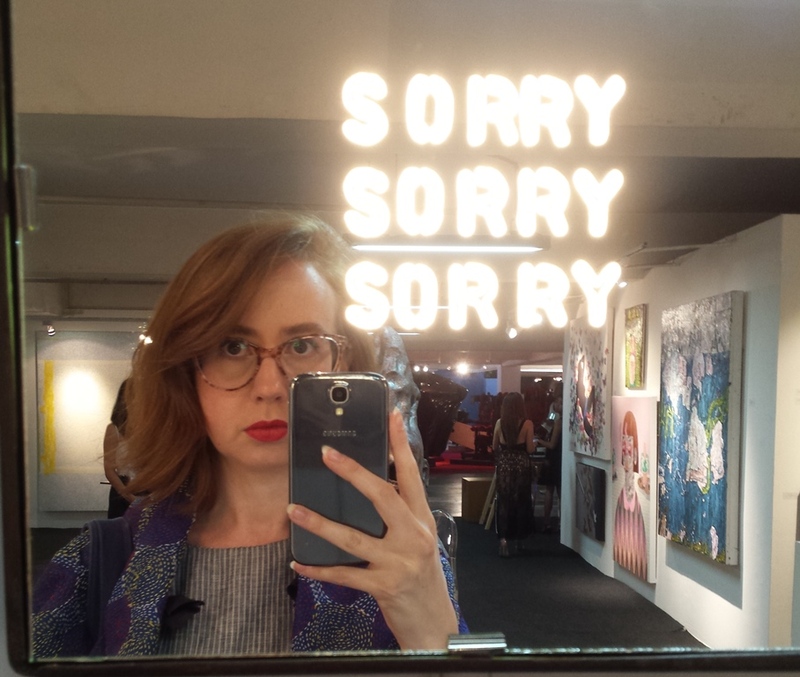 Last week I ventured to Melbourne for the Art Fair and its various official and unofficial satellite events. 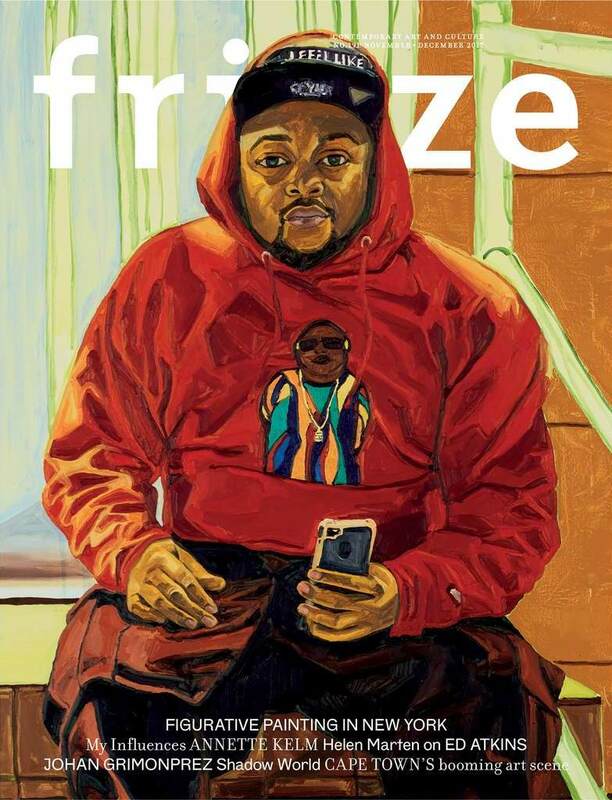 I was commissioned by RAVEN Contemporary to write about the inaugural Spring 1883 in the context of MAF and NotFair, which you can read on their site. I didn’t have the time or word count to include my highlights of the other goings-on so, as much for my own benefit as for the curiosity of others, here are my thoughts. Venturing into the Royal Exhibition Building for the Melbourne Art Fair as a member of the media was a strange feeling, as, for part or all of each Fair from 2006 to 2012 I attended to work at the stand of Darren Knight Gallery. Although I missed the visitor interaction that comes with ‘manning the booth’, I did not miss its attendant exhaustion, and it was wonderful to be able to take time to survey the Fair and return to galleries and works for slower, quieter consideration. Gallerists work hard at fairs and unfortunately don’t get this opportunity. Apart from my old stomping ground DKG, a number of stands and works made an impression amongst the maelstrom. Ryan Renshaw Gallery’s solo presentation of Sam Smith, whose work seamlessly moves between video and sculpture to explore the structure and possibilities of cinema, was exceptional. 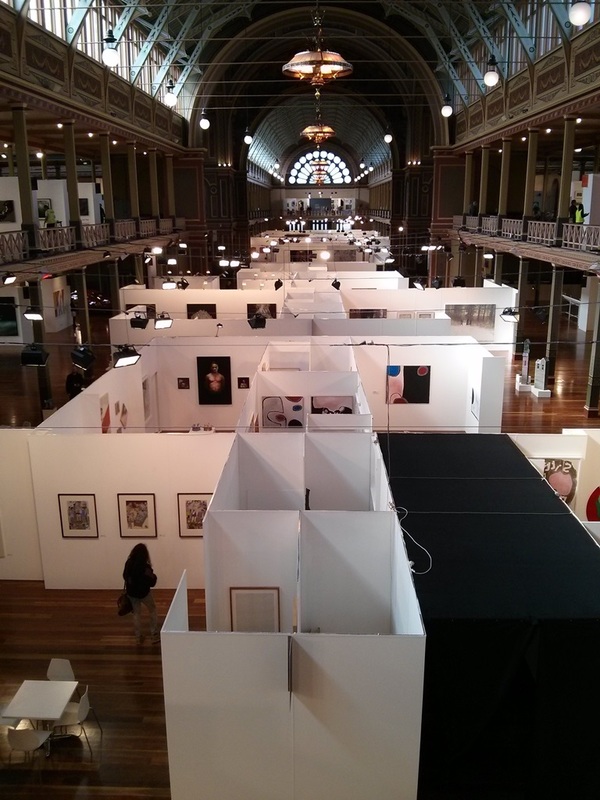 The Commercial, like many galleries, chose to do a number of hangs over the duration of the fair. At the time I visited they were showing a group hang including one of Archie Moore’s perfume portraits (which I experienced while on the 4A Curators Intensive) and a lovely painting by Mitch Cairns. I had a quiet encounter with Saburo Ota’s work at COHJU Contemporary Art. The artist collects seeds and delicately presents them under fine Japanese paper in the manner of postage stamps. Discovering microcosmic works like these within such a macrocosm of the art world can be a sort of rest for the brain. I enjoyed the Bradd Westmoreland paintings at Niagara Galleries, which in some ways spoke to the paintings of Ken Whisson, which featured both at Niagara and at Watters. Annandale Galleries once again showcased their prize artist William Kentridge (a triptych of video flipbooks was particularly appealing), however I was more pleased to encounter a number of Robert Motherwell lithographs and a small painting studding their stand. Modernism endures. Anna Schwartz Gallery’s presentation of Erwin Wurm was surely designed to be a crowd pleaser, but it did work very well as visitors wove in and out of the surreal figurative sculptures and photographs. Pearl Lam, whose Hong Kong gallery I visited in February, was making her first appearance at the Melbourne Art Fair as both a gallerist and as keynote speaker. Lam decided to bring her galleries to an Australian fair for the first time, after visiting MAF’s new sister fair Sydney Contemporary in 2013. In the Pearl Lam Galleries stand, amongst some bombastic eye-popping work by Joana Vasconcelos, I revisited the work of Zhou Yinghua aka Mr Chow, and also enjoyed the subtle abstractions of Loreta Saez Franco and Qin Yufen. I visited one of my several editors, Dan Rule, at the stand for his enterprise Perimeter Books, and treated myself to the small publication Diagrammatic writing by Johanna Drucker. 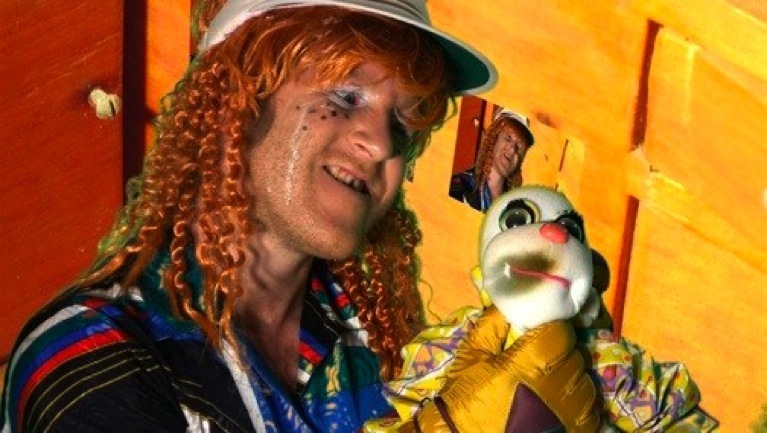 Simone Hine and Kyle Weise of Melbourne’s Screenspace had curated the new MAF Video programme. Kyle was a fellow 4A Curators Intensive participant so I was looking forward to checking out the program and it did not disappoint. On the day I visited, works grouped under the mantle of Quotidian Rhythms were playing. Sonia Leber & David Chesworth’s We are printers too occupied the theatre space, while a number of shorter pieces played in the booth. Tim Woodward, Nicole Breedon and Jacqui Shelton’s works in particular displayed endless and sometimes impotent actions, and sat in that intriguing space between humour and utter frustration. I wrote in depth about Spring 1883, and briefly about NotFair, in the RAVEN piece referred to earlier. As I said, Spring provided an opportunity for dealers and artists to play with the elaborately decorative, domestically-scaled environment of the suites of the Hotel Windsor. The site-specific installations and salon hangs did this most effectively, and there were many highlights. The intimacy of the spaces made for an interesting art-viewing experience, both in terms of the works themselves as well as interactions with the art dealers and fellow visitors. It was good to see Sydney artists (and sometimes collaborators) Paul Williams and Christopher Dolman represented in the mix at NotFair. The location, a council-owned unrenovated building in Collingwood, couldn’t have been further from the Hotel Windsor, and both satellite fairs play different roles in providing an alternative to the large commercial focus of the main event. NotFair felt like a pop-up artist-run gallery, except the mix of older and younger artists, organisers and attendees gave it a really dynamic feeling beyond the cliquey, art-school feel ARIs can sometimes have. It’s not a trip to Melbourne without a visit to the NGV. The David McDiarmid exhibition When this you see remember me has been widely appreciated by those in the contemporary art world. Despite the bright colours, glitter and booming celebratory soundtrack I still found it to be a melancholy show. This was both because of its exploration, through both artwork and archival material, of a bygone and seemingly braver era (some of which took place during my childhood in inner Sydney, now a very different place), and also obviously because of its necessary but sad memorialising of the fight against HIV/AIDS. The Sue Ford retrospective nearby was also rooted in archive. Ford’s photographs of herself and others over decades are a reminder of the simple power of the photograph to capture and record the passing of time. 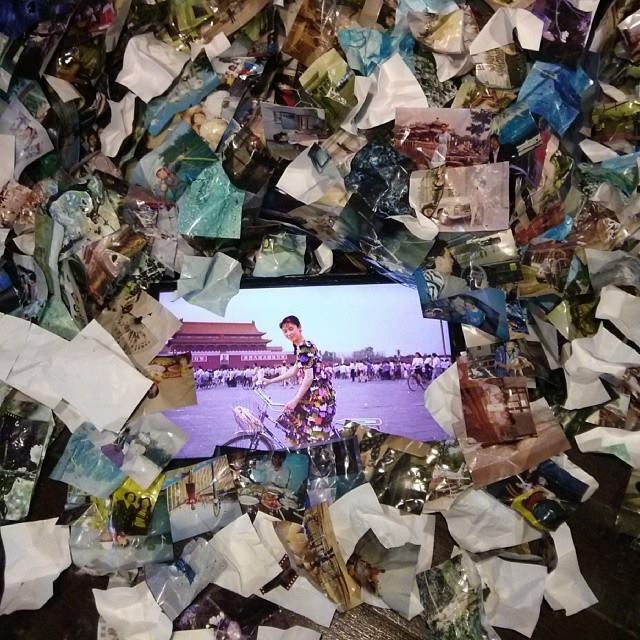 Over at NGV International, the large-scale video works of Chinese artist Wang Gongxin were on show. Projected onto tall vertical screens, they echoed traditional Chinese scroll paintings with contemporary subjects. On the other end of the scale were the works on paper of Romantic artist William Blake. Small and delicate, these pieces don’t often make it out onto display so this exhibition of the gallery’s complete Blake collection is a rare chance to peer into his world. Melbourne art week is always an exhausting but rewarding time, when, to paraphrase Roy Slaven & HG Nelson, too much art is barely enough. This entry was posted in Reviews, Words on 21/08/2014 by Chloé Wolifson. In a film made with the Australian Centre for Contemporary Art in Melbourne recently, influential British artist Tacita Dean thoughtfully discussed the future of the film-based arts in the face of the rise of digital photography. Just as analogue photography supposedly heralded the ‘death of painting’ in the mid-19th Century, this phenomenon appears to be increasingly preoccupying the art world, as evidenced by a number of current Sydney exhibitions. And then of course there is Christian Boltanski’s mammoth work Chance, currently on view at Carriageworks. Boltanski has often incorporated found photographs as a medium alongside others when describing collective and individual memory. Here his use of anonymous photographic subjects, as well Chance’s physical allusion to the increasingly redundant printing press, become threads to draw the audience into greater existential questions. Ultimately, that’s how every medium should serve its author and its audience. This entry was posted in Published Writing, Reviews, Reviews & Interviews, Words on 17/02/2014 by Chloé Wolifson. This exhibition at UTS Gallery, curated by Holly Williams and Chris Gaul, brings together eleven artists concerned with the information we all leave in our wake, and reveals many different possibilities as to what can happen to this information once it has been discarded by its original creator or user. There are many anonymous and unwilling subjects portrayed in Trace Recordings. In some works, the audience unwittingly becomes the subject of the piece, as the work is activated through looking. 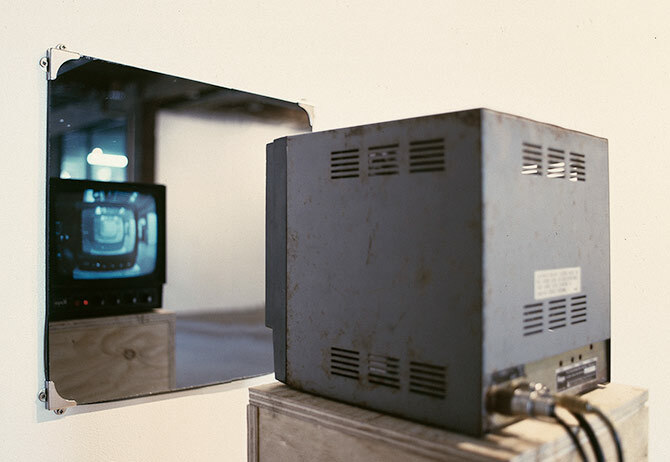 In the works of Denis Beaubois, who uses low-fi materials including CCTV screens and mirrors, the viewer’s image is sucked into an infinite vortex. 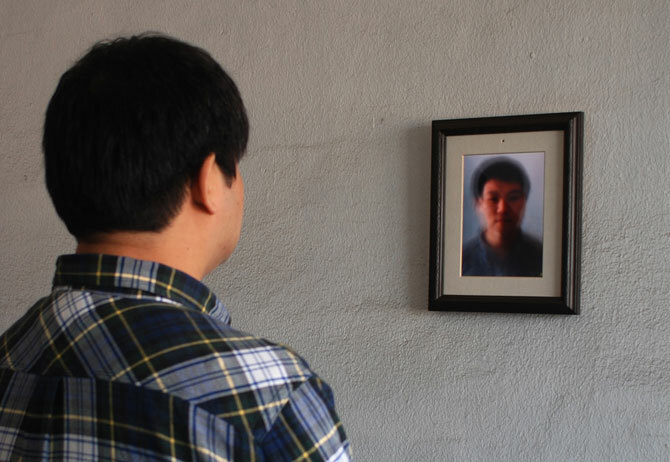 Memory 2013, by Shinsungback Kimyonghun, gradually forms a morphed portrait of everyone who has stood in front of it, via a tiny camera which records and superimposes likeness after likeness onto the screen. Several artists in the show use anonymous and apparently unconsenting subjects to demonstrate the possibilities of surveillance culture. 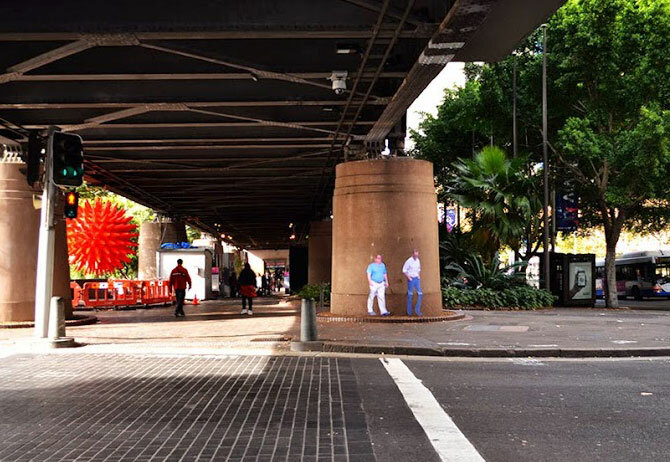 Paolo Cirio’s Street Ghosts turns the subversive nature of street art on its head, by reproducing life-sized images of people captured on Google Street View at the site where the image was originally taken. A fleeting, inconsequential moment in someone’s day is captured, providing a reminder about the gargantuan amounts of visual information (potentially featuring us) available online for anyone to use at will. Control has shifted to those who choose to seek and re-present this information. 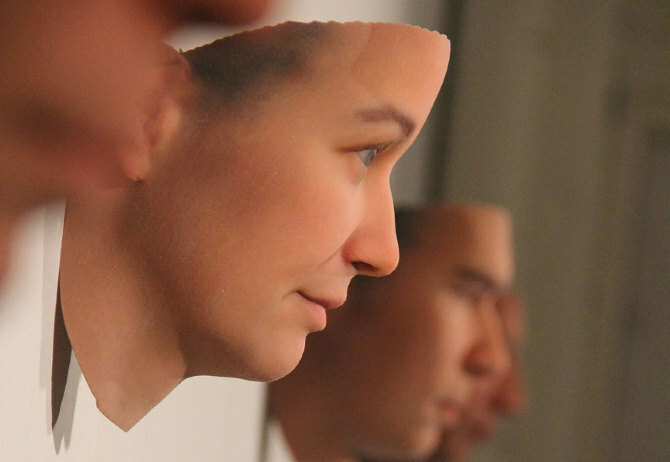 One such person is Heather Dewey-Hagborg, whose work Stranger Visions 2012 uses recent innovations including 3D printing to construct portraits of people based on DNA found on discarded cigarette butts and chewing gum. These uncanny sculptures, with their life-like features abruptly ending at the hairline to reveal negative space behind, reveal much and very little about the person simultaneously. A small vitrine below each ‘head’, as well as containing the object from which the DNA was retrieved and a photograph of its original location, lists the subject’s genetic ancestry (raising questions such as the potential health implications that could be measured). From this quite specific information, still infinite conclusions could be reached about her/his life. There are also many anonymous subjects of Benjamin Gaulon’s work 2.4Ghz, a small screen with antenna which tunes into unencrypted video on this particular frequency, common in baby monitors. Visitors are invited to borrow the work, exploring their city via its residents who have unknowingly left themselves open to surveillance via a profusion of these devices. Even as the object sits idle in the gallery, the image on its screen flits between images of unknown sites, where people move around unaware of being watched, often from the upper corners of rooms. 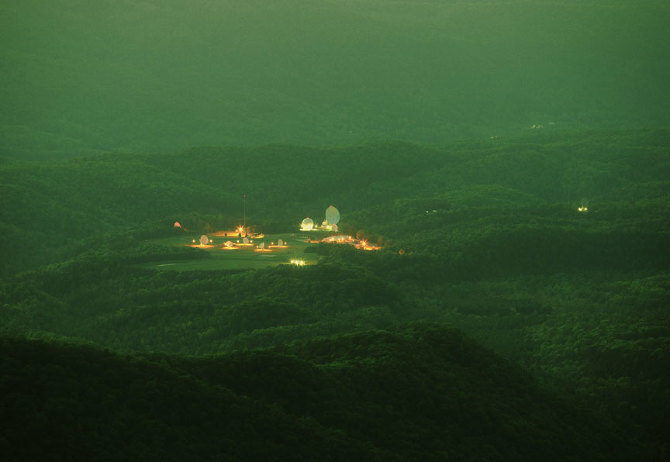 In contrast to this excess of broadcast noise, there is an eerie beauty to the work of Trevor Paglen, whose photograph They watch the moon 2010 depicts a secret NSA listening station in West Virginia, USA. This complex is located within a National Radio Quiet Zone, meaning that WiFi, FM radio and other transmissions are banned in order for the organisation to capitalise on the phenomenon of ‘moonbounce’, where communication signals can be captured and listened to post-broadcast as they return to earth. Paglen has also harnessed the moon’s power, using its light for this long-exposure image. The station appears as a massive glowing target in the middle of the wilderness, its clusters of satellite dishes un-camouflaged, much like the messages they intend to intercept. Another artist examining the surveillance work of the US government is James Bridle. The subject of Bridle’s work is the Disposition Matrix, a tool designed to find connections within intelligence and surveillance information collected by the government, the alarming result being the automated generating of lists of targets for drone strikes. A Quiet Disposition 2013 is, in turn, a system developed by Bridle to search online for reference to those involved with drone strikes and the Disposition Matrix. The resulting garbled text exposes the random and incorrect nature of the conclusions that can be drawn from such an automated system – it may be quiet but is potentially deadly. Adam Harvey directly invites the viewer to interact with modes of 21st century surveillance. His CV Dazzle Workshop 2010 teaches the audience about the possibilities of camouflage makeup for subverting facial recognition technologies. The black blocks placed geometrically and sporadically over the face are not only effective in distorting digital understanding of who is being watched, but also resemble war paint designs, imbuing the wearer with the feeling that they are arming themselves against this force of surveillance. In this sense, this work is not only active but activist, and provides an effective curatorial counterpoint to the more sinister works in the exhibition. An important aspect of Trace Recordings is the wall texts accompanying each work. It is arguable as to whether reading wall texts should be necessary in exhibitions in general, however in the case of this show it enhances understanding of the pieces, and in this context it feels prudent – like reading the terms and conditions before consenting to yet another incursion into our private lives by some unknown entity. Trace Recordings drags Orwell screaming into 2013. All images courtesy UTS Gallery, Sydney. This entry was posted in Reviews, Words on 13/11/2013 by Chloé Wolifson. At their essence Natalya Hughes’ paintings in Looking Twice are Japanese – simultaneously traditionally and contemporaneously so. However they effortlessly reach beyond this, into abstraction, psychedelia, psychoanalysis. Their Rorschach-like morphing surfaces are reinterpretations of the portraiture of 19th century Japanese artist Tsukioka Yoshitoshi. The luxurious and sometimes clashing combinations of colours and patterns found on the clothing and furnishings in Yoshitoshi’s images (bringing to mind the designs of fashion house Kenzo) are as important to his works as the subjects themselves. Hughes adopts and adapts these visual motifs, using digital design programs to create symmetrical compositions in which the subjects of Yoshitoshi’s portraits are each subsumed into a vortex of colour and shape. These images are rendered boldly and flatly in acrylic on plywood, in contrast to Yoshitoshi’s delicate woodblocks. Resulting works such as Looking cute 2013 draw the viewer in with suggestions of imagined figures – not necessarily human, but perhaps arthropod or even alien. The graphic quality of Hughes’ work also speaks to the contemporary Jap-anime aesthetic, not only through intense colour and hard-edged shapes, but also in the undertones of eroticism inherent in the morphing symmetrical forms. The artist has turned her hand to animation recently and it is not difficult to see how the development of these striking paintings could work in tandem with such a practice. Hughes’ practice also incorporates wallpaper, carpet and fabric designs which she has used to create trippy total environments in which her paintings pulse. 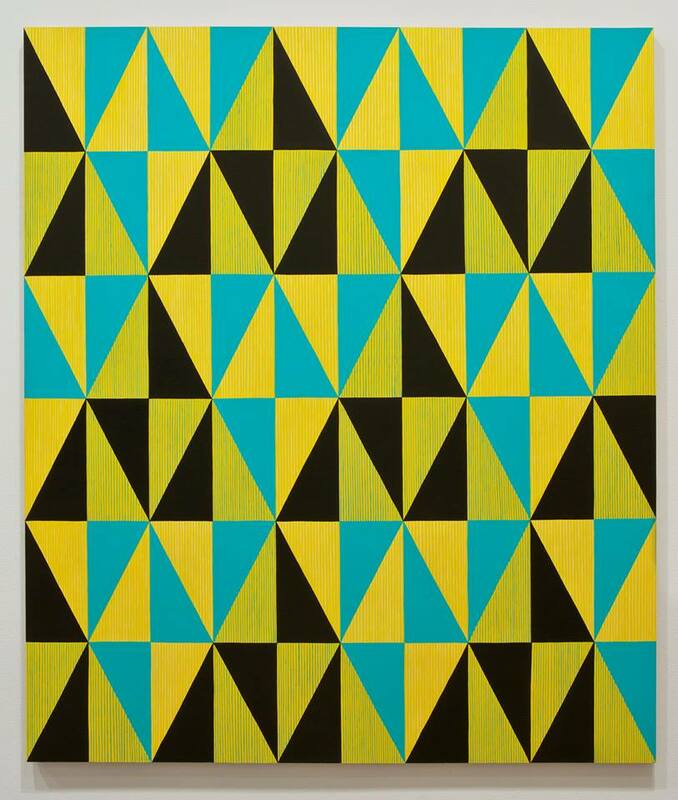 Abstract 2013 contains a percussive repetition of triangles, the geometry of which deliberately resists the narrative-charged readings of the other three paintings in the show. However the acid yellows and greens of this work harmonise with the other paintings in the exhibition while resonating with Western modernist traditions, and ultimately this small but rigorous exhibition is all the better for its inclusion. All images courtesy the artist and The Commercial, Redfern. This entry was posted in Reviews, Words on 07/11/2013 by Chloé Wolifson. Red Dose is an independent arts organisation recently formed to foster cross-pollination between Asian and Australian art communities. 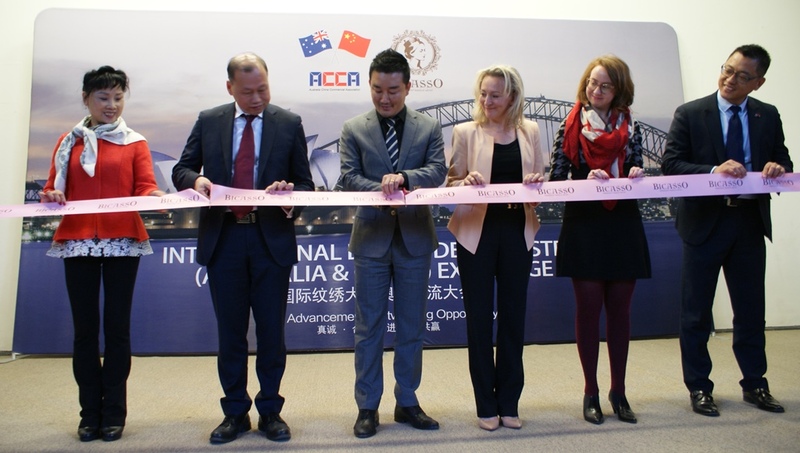 Their debut exhibition Red-Volution is taking place in association with the Hong Kong Economic and Trade Office, within the historic Hong Kong House building in Sydney’s central business district. Red Dose Artistic Director Kathy Leung has used the significance of the colour red in Asian cultures as a curatorial springboard, drawing together artists working across themes of nature, family and spirituality. Traditional Chinese aesthetics ran through the show, exemplified by the paper cutting works of Tianli Zu, whose installation Infinite Universe (2009-2013) dominated a wall of the exhibition. Although this work was indeed red, the colour acted as more of a symbolic thread through much of the work. Australian artists Keith Lane and Brett Bailey both drew on Asian imagery executed in surprising techniques – Lane’s painted plaster and fibreglass sculptures referencing the Chinese ceramic tradition, and Bailey’s paintings of familiar natural phenomenon (such as Dry Riverbed) bearing striking resemblance to Japanese ink on paper works, despite being painted on canvas. Likewise, Laurens Tan’s small-scale sculpture of a chair, The Depth of Ease (Lounge) 2007 used fibreglass and auto paint to produce a red glossy surface akin to lacquer ware. However the works which resonated most strongly within the elaborate heritage interior of Hong Kong House were not necessarily the most traditional. Douglas Cham’s ceramic sculptural series Banana-kids (2009) depict white crocodiles emerging from banana skins. Cham explains: “Banana-kids is the nickname given to ethnic Chinese, born and raised in Australia, by first-generation Chinese migrants. 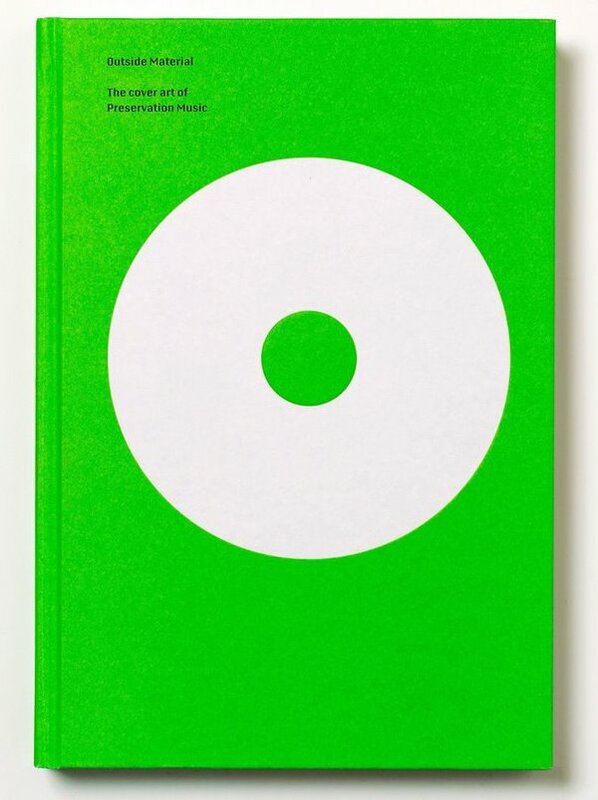 The term means ‘white’ inside and ‘yellow’ outside.” [Artist’s statement from exhibition catalogue.] These slightly menacing white creatures slithering out of their pop-art banana skin cloaks were intriguing in their boldness. 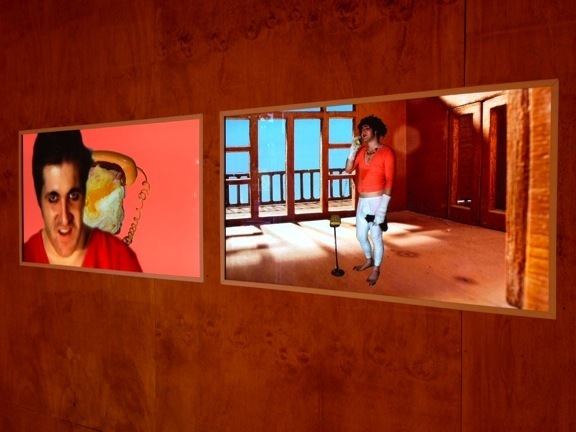 As well as the work of ten visual artists, the exhibition also includes three short films. While the exhibition itself is a rather diverse selection of work, the short film programme is quite strong. Each film explored the isolation of life within a busy metropolis, in very different ways. Pako Leung’s Still on the Bridge (2011) observed the quotidian of a widowed snack vendor, attempting to go about his business as his neighbourhood fades around him. In Case (2012) by Ivana Lai, follows a young man living with degenerating eyesight and a hoarding grandmother. Highly saturated colours (the duo live in an apartment dominated by green décor, including a green fridge) are accompanied by the man’s tape-recorded journals as he attempts to hoard his own memories of what will soon fade from his vision. The third short film in the exhibition, First Light (2013) by Lilian Fu, is a charming animation, whose protagonist loses her home amidst the relentless progress of a modern city. Her search to recover where she belongs is revealing and ultimately beautiful. Red Dose is an example of a new model for bringing contemporary art to wider audiences. It will be interesting to see its forthcoming projects as contemporary Asian art practice continues to be closely observed by audiences here and overseas. Red-volution continues until 14 November 2013. This entry was posted in Reviews, Words on 04/11/2013 by Chloé Wolifson. Simultaneously repellent and compelling, Heath Franco’s video work draws the viewer in with its references to suburbia and keeps us there through exaggerated grotesquery and repetition. Epitomised by one bully caricature beating up a freaky, burn-marked toy with the repeated phrase “Stop hitting yourself”, the viewer may find they are unable to look away, effectively punishing themselves over and over. The wood-panelled interior of the gallery, rather than providing a sense of warmth which wood often gives, instead exudes a sickly yellow sense of suburban claustrophobia, as if we’re stuck in the kitsch kitchen cupboard of the Dream Home in question, forced to observe the goings-on in all their repetitive glory. Franco himself relishes the multitude of roles he adopts within this surreal pseudo-narrative. With a nod to the panto tradition, his not-fooling-anyone drag personas queasily chant their lines to the point of abstraction. These performances take on an element of endurance as we begin to notice Franco fatiguing while he imbues effort into every line. The non sequiturs in the work add to its surrealism, which regularly spills over into the realm of nightmare as we struggle to grasp for meaning within this foreign landscape. There is also humour in these motifs, perhaps because as a conscious viewer we are aware of our ability to separate ourselves from this scenario rather than become confused or controlled by it. Nonetheless there is still a compulsion to stay through the duration of Dream Home, to make some sense of it as one endeavours to make sense of one’s own dreams. 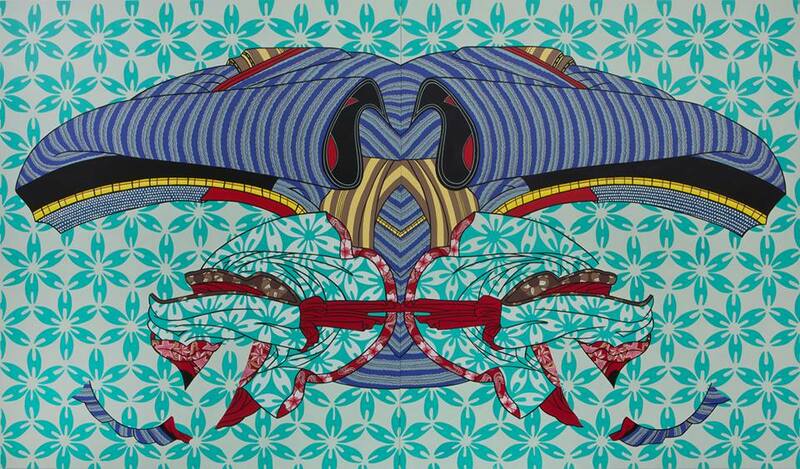 Images courtesy the artist and Galerie Pompom, Sydney. Please visit Galerie Pompom for more information. This entry was posted in Reviews, Words on 16/07/2012 by Chloé Wolifson. Cairns’ careful selection of materials is crucial to the feeling these paintings possess of being of another time. A dark raw linen canvas, worked over with smooth broad brushstrokes of oil paint in a limited palette of deep blue and sunflower yellow, and the combination of pensive and humorous subject matter in Cairns’ paintings furthers this notion. The describing of predominantly hard-edged imagery in two quite saturated contrasting colours is suggestive of mid-20th century print advertising, and also speaks to Cairns’ interest in the act of cartooning, which is brought to the forefront in this exhibition with the inclusion of a number of cartoon prints produced as a result of Cairns’ time at the Alan Moir Advanced Cartoon Classes. 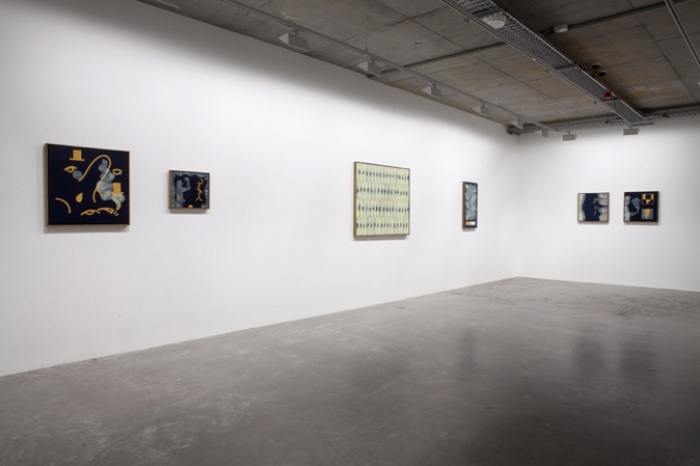 The cartoons tend to convey more detail through their use of line, however the centrepiece of the exhibition is still Cairns’ paintings with their virtuosic and seamless brushstrokes, seductive surfaces and witty compositions. See more images at BREENSPACE. This entry was posted in Reviews, Words on 11/05/2012 by Chloé Wolifson.